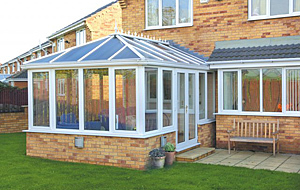 Add value and extra living space to your home with our range of Edwardian DIY Conservatories.. The self build Edwardian conservatory kit comes a close second to the lean-to with regards demand in the UK. Primarily, this is due to it's aesthetically pleasing roof and maximized floor area compared to the Victorian style. The maximum dimensions you can apply are 6m x 6m when using a polycarbonate roof and 5m x 5m with a glass roof. It has become increasingly popular to have a ¾ of full height wall on the side of the conservatory that is facing the boundary. This has two benefits, firstly creating privacy and secondly is very practical for placing large furniture items against or hanging pictures. Although not as simple to assemble as the lean-to DIY kit roof it is still pretty straight forward. All the roof bar fixings are already in place and you can, without tightening any bolts, loosely place all the components into position to check that it all works before making it secure. Once you have fixed the cill to the dwarf walls, you just slide to frames into position in the pre-routed holes The wall frames arrive individually packaged and join together using the 'Kwik Konnect' system which saves loads of time as no screw are required and the glazing has already been installed at the factory.